And now, a brief historic interlude. . . .
Well, over the last couple of days I've been dealing with having a wisdom tooth removed (not a recreational activity I recommend, btw), so that's rather put the squelch on boat work while I get to play the sympathy card, whining piteously, and, in general, getting out of things I normally have to do. Still and all, not worth it. Get your teeth cleaned, kids. 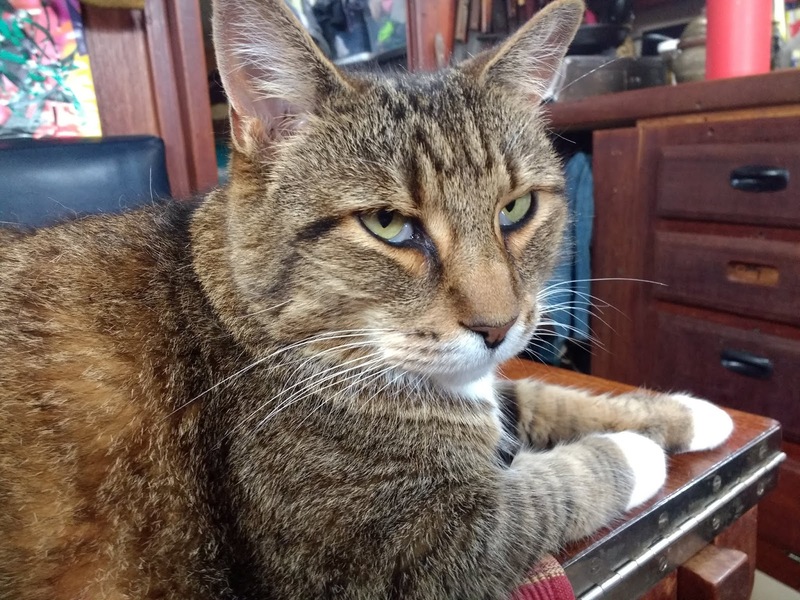 At any rate, I've spent a bit of the time surfing mindlessly and came to realize just how many new viewers this blog has acquired over the last year. Welcome, guys, and thanks for stopping by. I also realized that, unless you've been riding with us on this trip for a bit you might not know who we are, so I thought I'd take a moment of my recovery time to tip you off. 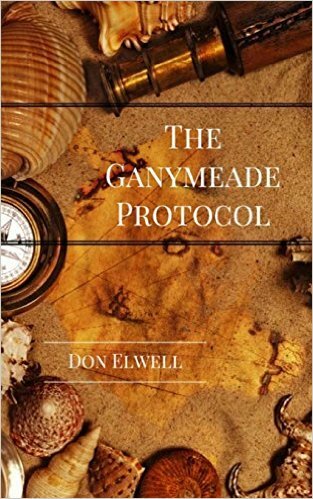 Let's see. . . .
We're Don and Gail Elwell (and, of course, first cat Magellan). 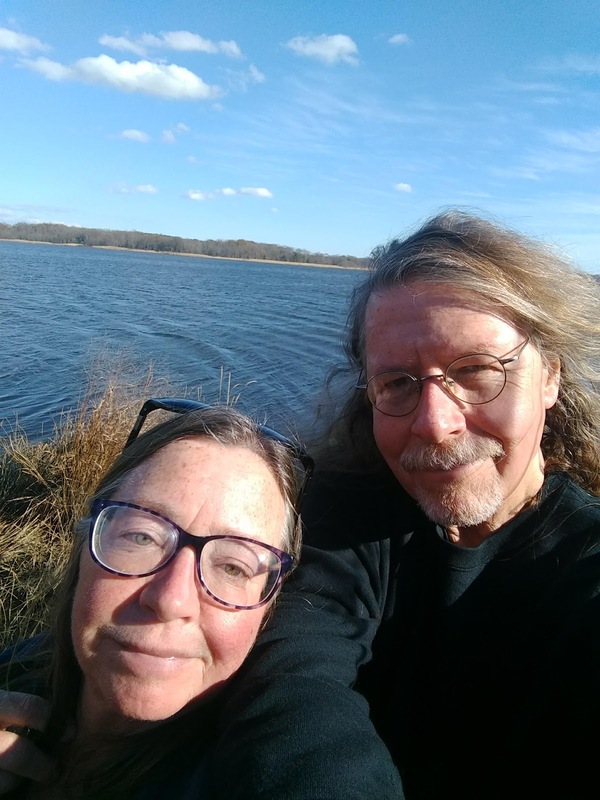 We're long time artists and teachers, both retired college professors, and active experimenters, creators, re-enactors, larpers, and geeks in general. Gail, my companion for (ulp) near 35 years, is a teacher, sculptor, amazing chef, and collage artist. 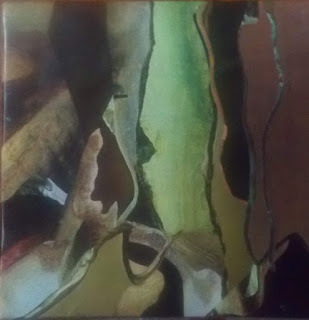 You can find her work on Facebook and at her blog at life, art, water. Her most recent works are some rather amazing collages, beautifully painterly works, that I highly recommend you check out. For myself, I've been a writer and theatre geek for most of my life, have started a couple of very successful theatre companies, including the Greylight theatre of Illinois and the Grindlebone Arts Collective in Baltimore, taught at a number of institutions, and in general made a public spectacle of myself. In recent years, I've mostly been a writer and editor, publishing a number of novels and play anthologies through Wild Shore Press (created as Grindlebone's in-house publisher). Rather proud of this one. Available hardcopy or Ebook here. At any rate, as part of the work with Grindlebone Arts, we set up a thing called the "Center for Bypassed Technologies" on the Grindlebone site. 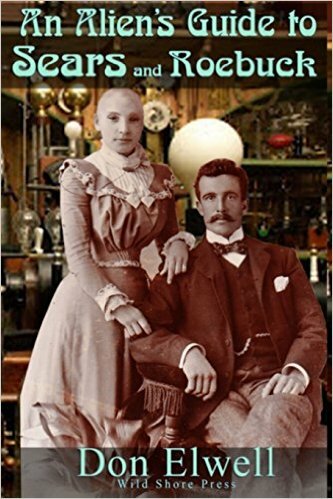 It was the confluence of our working as historic re-enactors, our love of history (and science fiction, futurism, and general oddness), and my own geeky fascination with the technologies that were bypassed because of cheap energy. This led directly to the creation of this blog, and of the original shantyboat Floating Empire. If you're interested in the rational that started this whole thing, give a click here and see how and why we started this voyage all the way back in '14. In the intervening years, we've built ( or re-built) three vessels, Experimented with solar power systems, electric drives, paddlewheels, composting toilets, new construction materials, brewing, food preservation, wood gasification, kerosene stoves, vertical gardening, and a host of other things, all while continuing to write and do artwork and, in general, get ourselves in trouble at every opportunity. 2019 should be a really interesting year for us. We'll (hopefully, FINALLY) get the drive working well enough to travel in our electric cruiser Tesla's Revenge, we'll be doing more brewing, lots more elaborate cooking, and I'll have two new novels (Zarabeth's World and the sequel to my novel The Ganymeade Protocol --which people have been bugging me to do-- titled The Flood Tarot) out and a poetry compilation of the real and virtual worlds called called Virtually Poetic (I'm editing that one) featuring real world poets and poets from the Second Life virtual environment. I've got the sequel to this coming out in 2019, so you should probably pick up a copy and catch up. 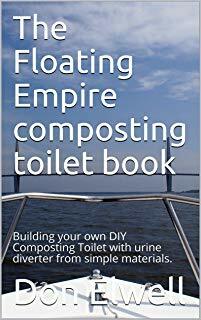 We've noticed of late a huge amount of interest in things like our diy composting toilet (with diy urine diverter) and the electric paddlewheel drive. I promise we'll be putting up more details, designs, upgrades, updates, warnings, and ideas about those in the coming weeks--I feel like we're on a roll with that--as well as all sorts of other useful and interesting things. I just wanted to say thanks so much for all of you who have joined us in this trip. Your comments are always appreciated, or you can reach us at Mungo@thefloatingempire.com. Lordie, the man is a wimp. This thing is surprisingly simple and effective. 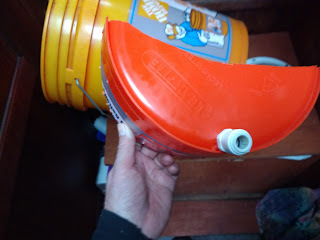 Having lived with our DIY Urine Diverter in our DIY Composting Toilet for near on a year now, I thought it might be a good time to address the "what worked" and "what didn't" of the thing. For the initial posts on construction, you can go have a look here. In general, the thing has worked really well, and with very few problems. It extends to nearly two weeks the time between needing to empty the solid waste from the toilet, and makes that job less arduous because the mass is far lighter without being chocked full of pee. Not having liquid pooling in the compost bucket means far less chance of insects or odor. We use a spray bottle with a weak bleach solution and spray the diverter after every couple of uses, which keeps the smell virtually nonexistent, and the bottle (a disused 1 1/2 gallon cat litter container) is far simpler to empty than dumping the entire composting bucket, I can tell you. There, however, a few things that we might have done differently (and which we will do differently in subsequent versions) that we thought we'd impart. First and foremost, we used 1/2" (about 13 mm) tubing for the drain. The interior diameter of this hose is only about 3/8" (about 9.5mm), which is fine for drainage. From the beginning, however, we've used mostly wood chips and wood stove pellets for mass in the composter, and dropping even a single pellet into the diverter can plug the thing (happens about twice a month) necessitating using a piece of wire or something to dislodge it. Not a deal breaker, certainly, but irritating. In future iterations, we'll endeavor to use a wider diameter tube, which should solve that instantly. Since this was a retrofit to a composting toilet we'd already built, we had to get a bit creative with routing the tube to the bottle. Because it looks a bit like a novelty drinking straw, it's rather easy to kink it when pulling or replacing the compost bucket. In designing a new housing, we would opt for a much more straightforward (and shorter) route for the hose. Since the initial install, we've had to play a bit with both the height and the depth of the diverter to keep it from hitting your bum on the toilet. This was pretty easy, and involved screwing the thing in place half an inch lower and using a pocket knife to cut the curve of the top of the diverter a bit more deeply to keep it out of the way. Neither affected the efficacy of the unit. By the way, rotating the compost buckets is a plus. Even with a liner, the plastic still manages to pick up some stink (though it isn't evident until you go to dump them). Being able to leave one out to air while the other is in use keeps that down . I'm curious if a stainless steel bucket might be more resistant to retaining odor. When choosing your diverter bottle, virtually anything will work, but as unattractive as it may be, I'd strongly recommend getting one in which you can easily see the liquid level. Humans produce a surprising amount of pee, and though we've only overtopped it once, it wasn't a pleasant experience cleaning it up. There are a bunch of other fixes for this, including possibly sealing the hose into the bottle while providing an air vent of some kind, but the simplest is just to be able to see just how much of the smelly amber stuff with which you're dealing so you can empty it in a timely fashion. Lastly, note that, if you're in a non-mobile situation, routing the urine hose permanently into a dry well or into a garden or flower bed (urine being a major source of nitrogen) can mean you NEVER have to empty the thing and your flowers or lawn can reap the benefits. All in all, I'm really happy we built the thing and rather wish we'd done so sooner. Hiking at Marshy Point Nature Center on a sunny December day. The late fall has been as erratic as the rest of the year here on the Chesapeake. Two days ago it was sunny and 60 degrees F. Today, it's barely above freezing. Still, we did get in a lovely hike at one of our favorite places here (Marshy Point Nature Center) and managed to finish getting our stuff into the storage space. Now we've got a couple of chilly days, suitable for finishing the first draft of the novel at which I've been working. Close now. 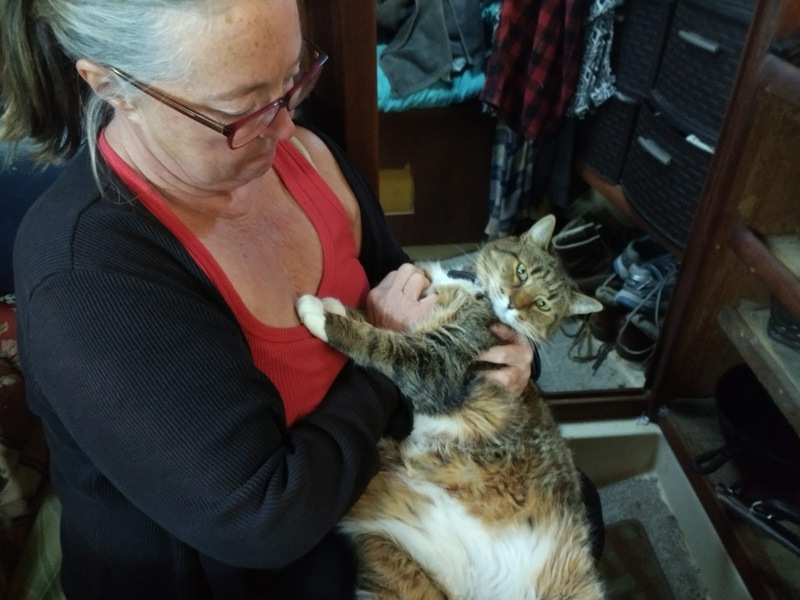 Fortunately, the solution to chilly feet is ALWAYS a well padded ship's cat. So it's a couple of days of writing and artwork, and then maybe we can re-address the electric drive controller.